Remembering God’s faithful provision of our Savior Redeemer is reason enough for our hearts to overflow with joy-filled anticipation of the Season. Yet, there is a darker side of anticipation that can steal our joy and our peace–the dark stain of DREAD. As the pressures of shopping, finances being pushed to the limit and a myriad of activities and social obligations threaten to overwhelm us, we lose sight of the simple joy of remembering God’s Goodness and have no peace.. Many complain that living in convoluted times has caused DREAD to darken the door of ANTICIPATION when it comes to Celebrating God’s Amazing Gift. We blame culture for robbing us of the PEACE that is rightfully ours in Christ. I accepted such arguments in years past, and felt defeated and depressed. However, I have since decided that neither the times nor the culture have power to rob Christians of the Peace that is inherently ours in celebrating Christ’s Coming. In fact, rather than shifting blame to outside influences, we need to take responsibility for the choices we make as we reel-in the stresses and strains that can lead us to dreading Christmas. I write this to encourage you to take an honest look at where you are one week into the Christmas Season. On a scale from one to ten, with joyful anticipation at number ten and dread at number one, where are you? Before going any further, let me share something very simple yet surprisingly profound that helped me to adjust my number on the anticipation scale this past week. The insight came as I prepared to lead the Advent wreath workshop at my church. I felt privileged to have been asked to lead the workshop, but inwardly . . . I quaked for weeks as I anticipated (dare I admit . . . I dreaded?!) blundering my way through presenting something I felt ill-equipped to do! I repeatedly asked myself, “Who am I to instruct a group of people who already know what they are doing?” In fear, I did what I generally do . . . I started researching everything I could that related to “Advent wreaths” on the Internet! Not having grown up observing the Advent tradition, I understood Advent to be part of a church service–more formal. What I learned in my research was that the Advent wreath was originally meant for use in Christian homes and was not used formally in Church services (in a broad sense) until the mid-twentieth century. What a revelation! 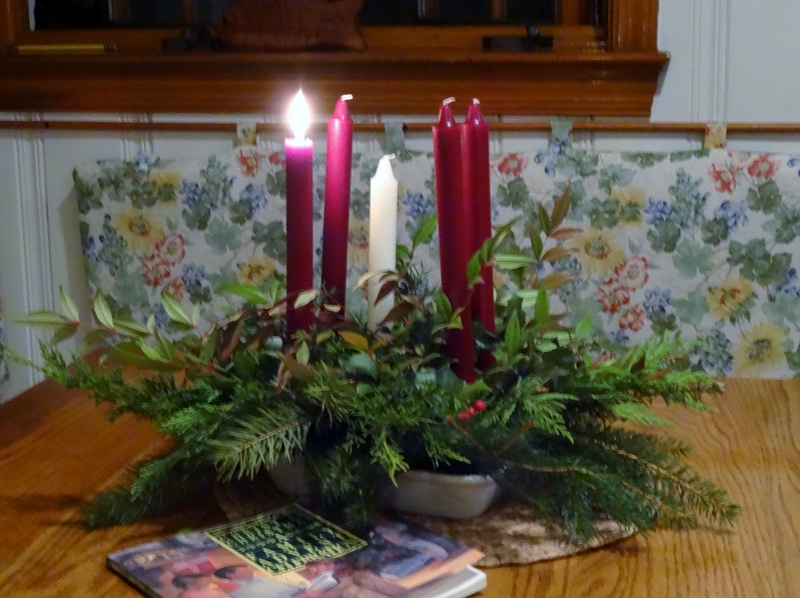 With that insight, I realized that, instead of placing our Advent wreath in the more formal setting of our dining room table (where it has been largely forgotten and unused in past years), it would be far more fitting to put it on our kitchen table for daily use. So . . . that is exactly what I did. The result of making this simple change? Amazing and unexpected. This past week when my husband and I shared our main meal (which varies with his work schedule) we lit the first candle, prayed and read the Scripture to each other as we ate. (The paperback we are using [found stuffed in amongst some Christmas dishes and decorations] is one we used when our children were young.) After doing this three days in a row I realized how much I looked forward to sharing time with God and my husband each day. Reflecting on it now, I marvel at how the simple shift from a formal mindset to daily use increased my level of anticipation as the days lead up to Celebrating Christ’s Birth. Along with the higher level of anticipation, the result has been a greater inward peace as the dissonance/noise of Christmas pressures are put (essentially) on the “back burner” each day. In the past, I looked at Advent wreaths as “one more should” to be saddled with. However, what I discovered is the benefit of setting aside the “noise” of the many demands that surround Christmas with the simple lighting of a candle (a reminder that Jesus is the Light of the world) and savoring the Scripture over a meal–profound peace. Wherever you are on the anticipation scale it is never too late to make adjustments to move away from dread toward joyful anticipation. It may sound silly, but I am actually looking forward to lighting the additional candles! Simple anticipation . . . profound peace . . . rejoicing in Him! Good post. I think I am a 9 or 10. I used to struggle as a kid with post holiday blues, but not anymore. God fills me up, so I have that wonderful staying peace. Thank you for this reminder. Merry Christmas! You look like a 9 or 10–Praise God for consistency inwardly and outwardly! May His blessing abound for you and yours this Christmas!